Today is the last day of the FitFluential Spring Clean challenge, which means I’m very close to have been eating clean for a whole month! As someone who previously lived on processed carbs and sweets, this was a tough one for me at first. But, now that I’m almost done, I’m feeling really great and I think I’m going to largely keep eating clean, while allowing for occasional indulgences, like a night at the ball park. I did learn a lot about what I needed to do to make clean eating easier, and I wanted to share what I learned with you guys just in case you’re struggling with eating clean like I did when I first started the challenge. 1. Plan ahead and prep your meals! I’d say this is the biggest thing you can do. I did more meal prep this month than I had in months past, and it made it much easier when I came home from work exhausted just to heat up some quinoa, sweet potatoes, and lean protein than to cook something from scratch. Read these! 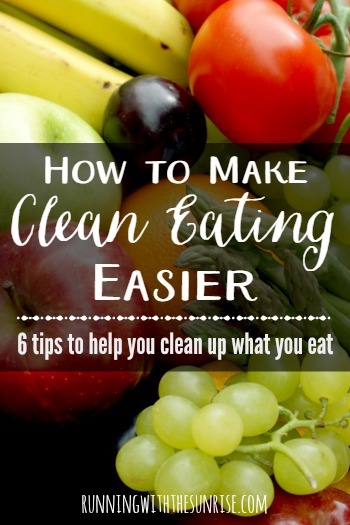 Six tips to help make clean eating easier. 2. Go grocery shopping. I stopped by the grocery store a LOT to make sure I had clean, healthy foods. Unfortunately clean foods tend to spoil more quickly than processed foods (shocker), so you may have to make more trips to the store to pick up more fruits and veggies. It’s worth it, though! 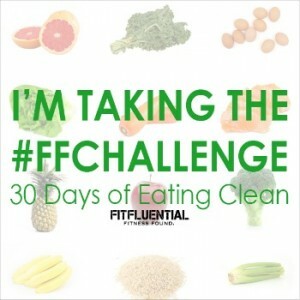 Social media was really helpful for accountability and support during the FitFluential Spring Clean challenge. 4. Have a support system. Luckily my husband was very supportive of my challenge and did a great job of checking with me to see what I could eat before planning meals that we were both eating. (Full confession: we didn’t always eat the same thing.) I also have a good friend from work who eats paleo, and it helped to be able to commiserate with him about how I was really craving a doughnut or pizza. Feel free to contact me through social media if you need a clean eating buddy—I’d be happy to help! 5. Have healthy snacks ready. Between working busy jobs (plural now) and working out most days of the week, I definitely get hungry between meals. Having healthy snack options ready was huge for me. I’m surprised I haven’t turned into an almond since I ate so many almonds! I don’t need to lose weight so I ate extra nuts during the challenge to help me get in some extra calories since most healthy foods are relatively low calorie. 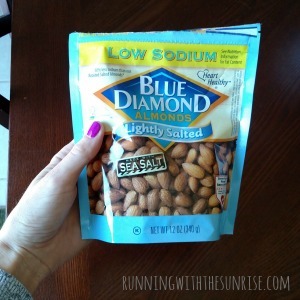 I almost always had a small bag of almonds ready in case I needed a snack. 6. Have a plan for eating healthy if you have to eat out. There were times when I was just too short on time after work to cook, so I had a couple of options in my pocket if I needed to eat out. I did a lot of Chipotle, and I ate a couple of BUFF Bowls from Noodles and Company, which are essentially spinach and some cooked veggies mixed with your protein of choice. And the Whole Foods salad bar was my best friend during the challenge. I love you, salad bar. Do you have any clean eating tips? Have you ever done a clean eating challenge? What would be the toughest thing for you to give up? I have been craving Lou Malnati’s pizza for a month now! Sometimes having husbands can be the worst because they buy junk and I end up being the one to eat it! Whenever he goes grocery shopping its so interesting to see what he will come home with. When I cleaned up my diet years ago, that was my own clean eating challenge of sorts. I think the things that I have craved the most in the past/present have mostly been drinks–coffe, alcohol, soda–and gum. And chick-fil-a waffle fries and sandwiches. Yes, Chick-fil-a. I ate some of their grilled chicken nuggets during my challenge when I was desperate and tired. Not bad. I do my best to keep “good” food in the house and have treats out of the house, or hidden away. I’m very much and out-of-sight out-of-mind kind of person, so I can have junk but if it’s not on the counter, I won’t eat it. I always bring my lunches to work and that helps because I’m not tempted to buy junk for lunches. Giordano’s is my go-to for pizza. I know that’s not what we are talking about, but just thought I would share. I generally eat well 80% of the time and then there are times when I want a lemon pistachio donut and I must have it. Since I’m not normally eating a lot of sugar, that one thing will usually satisfy me and actually I may not even finish it since it is pretty sweet. Congrats on the challenge! Hey, it’s a legit discussion, especially for us Chicagoans! I like Giordanos, too. A donut sounds so wonderful right now… I am currently all about the pastries! Joining a clean eating challenge was one of my all time best decisions. I no idea I could feel so good and I eliminated migraines. No food is worth migraines so clean eating was easier than I expected. Yes! I am so glad I did this challenge, too, because I feel wonderful! I do want to indulge in some cravings from time to time, but I want to largely follow the same clean eating guidelines. It’s worth it if it helps you feel good! Having a plan for snacks has been big for me, because otherwise I’ll reach for the bread/desserts :P. Happy Friday, Beth!! Holy, I had no idea you were eating clean for a whole month! How did I miss this?! You are amazing. Good job! Great tips. Awesome job making it through the month!